Architects and planners who embrace New Urbanism created the Wellington Neighborhood in 1999. They negotiated for the land owned by the B&B mining company and made environmental improvements that made French Creek a better habitat for aquatic life. And humans. 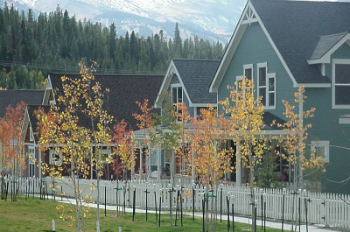 Where there had been dredge tailings from the Wellington Mine, one of the largest ore producers in the country, a team of architects and developers built the Wellington homes for sale. They designed homes that combined Victorian details and scale with the layout of New Urbanism. Read more about this classic subdivision, or start your search for Wellington real estate listings below. 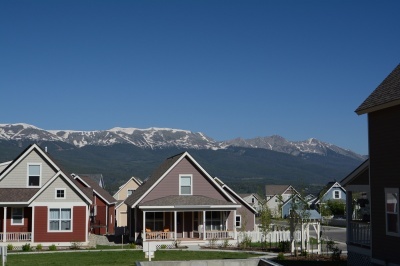 'New' as used in the Wellington Neighborhood project, is the idea of a big green space shared by, and faced onto, by all the homes in one block. ‘Urban’ is the fact that the garage and driveway are off small alleyways out the back. This way the cars, chores and work happen away from the community space, which is just a step off the front porch. The style of these porches were borrowed from the architecture popular when Breckenridge was founded, the Victorian, and are borrowed for the homes in the Wellington Neighborhood, including gingerbread gables, tall thin windows, eaves breaking the roofline, porches and picket fences. The neighborhood has become a community since it was built, and is home to many full-time local employees, who benefit from its deed-restriction programs. For the environmental clean up, the community planning and relatively low price tags, the Wellington Neighborhood received a national, smart-growth award from the EPA. French Creek was severely polluted by mining activities upstream Environmental restoration of the B&B mine lands, in the late 1990s, made the creek an asset where it once had been a liability. French Creek now runs between the original Wellington Neighborhood and the newer southern addition. A bridge across the creek gives all the homeowners access to a large playing field and playground along the river, and a access to the bus stop and sidewalks on French Gulch Road. French Gulch Road continues east to the saddle between Mt. Guyot and Baldy Mountain. Along it, and spurs off it offer plenty of backcountry access. Size: 1024 sq. ft. to 2643 sq. ft. Amenities: Close to town, bus route, trail access, near French Greek. From the traffic circle on the north side of Breckenridge, head north for 2/10 of a mile and turn east (right) on County Road 450. Continue on this road as it changes name to Reiling Road (it is the straighter fork, the right if any question). After a mile, Wellington Road will come in from the right and the road is now called French Gulch Road. The Wellington Neighborhood is here, on the south (right) side of the road. From the center of Breckenridge (Ski Hill Road and Main Street) go one block north and turn east (right) on Wellington Road. Continue on Wellington until it joins French Gulch Road. Take a right onto French Gulch Road, and the Wellington Neighborhood will be on your right, on the south side of the road. Additional Amenities: Small section south of French Creek, with park. We have the answers to all of your burning real estate questions! Get in touch with us online or by calling us at (970) 453-2200.